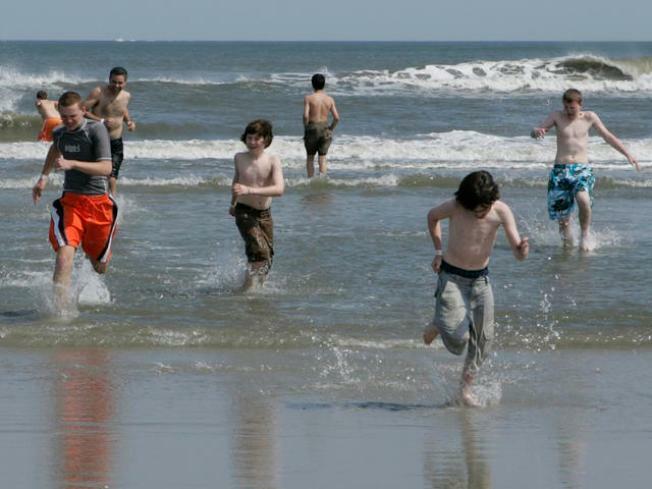 Youngsters run through the chilly water of the Atlantic Ocean in Wildwood, N.J. The latest victim of the economic meltdown is the Wildwoods Boat Show & Fishing Expo. A spokesman for the Greater Wildwood Chamber of Commerce says people just aren't spending and it wouldn't be fair to vendors to pay to be part of the event that in all likelihood wouldn't be successful. The decision to scrap the show, which would have been held in April, came after other efforts to cut costs, including reducing vendor fees by 20 percent. Wildwood Mayor Ernie Troiano Jr. says the boat show is a luxury event, and with money tight, luxuries are the first to go. Organizers hope the show can return next year.